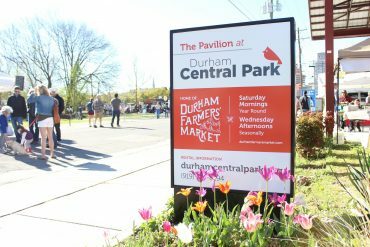 Durham Central Park is the proud to be home of Durham Farmers Market—a world-class farmers market that is a key part of the vitality and excitement that happens every Saturday morning at the park. The Durham Farmers Market is an all local, producer-only market. The market features the produce and wares of more than 50 vendors, all of whom are located within 70 miles of the market. For more detailed information, you can visit their website at durhamfarmersmarket.com. What can I find at the Durham Farmers Market? Locally grown fruits and vegetables, meats, eggs, cut flowers, potted plants, artisanal cheeses and breads, home-baked pies, honey, handmade chocolates, preserves, local wines, hand-made soaps, pottery, jewelry and artwork of all sorts. The Durham Farmers’ Market is open year round on Saturday and seasonally on Wednesdays. From April to October, Wednesdays from 3:00pm to 6:00pm. For more information, visit durhamfarmersmarket.com. Does your non-profit want to setup a table during the Farmers’ Market? Nonprofit organizations can register to setup a table or booth in the Sister City Grove during the Durham Farmers’ Market.